Asia Frontier Capital Ltd. is a pioneering fund management company based in Hong Kong that specializes in investing in high growth Asian frontier economies by managing the AFC Asia Frontier Fund, AFC Iraq Fund, AFC Uzbekistan Fund, and the AFC Vietnam Fund. The AFC Asia Frontier Fund invests in public equities of Asian frontier countries that are seeing increasing consumption due to favorable demographic trends, rising incomes and high GDP growth. The fund invests in listed equities of companies that have their principal business activities in Bangladesh, Bhutan, Cambodia, Iraq, Kazakhstan, Kyrgyzstan, Laos, Maldives, Mongolia, Myanmar (Burma), Nepal, Pakistan, Papua New Guinea, Sri Lanka, Uzbekistan, and Vietnam. The AFC Asia Frontier Fund is positioned to take advantage of the continuing economic shifts in these countries and offers high returns combined with significant diversification opportunities. 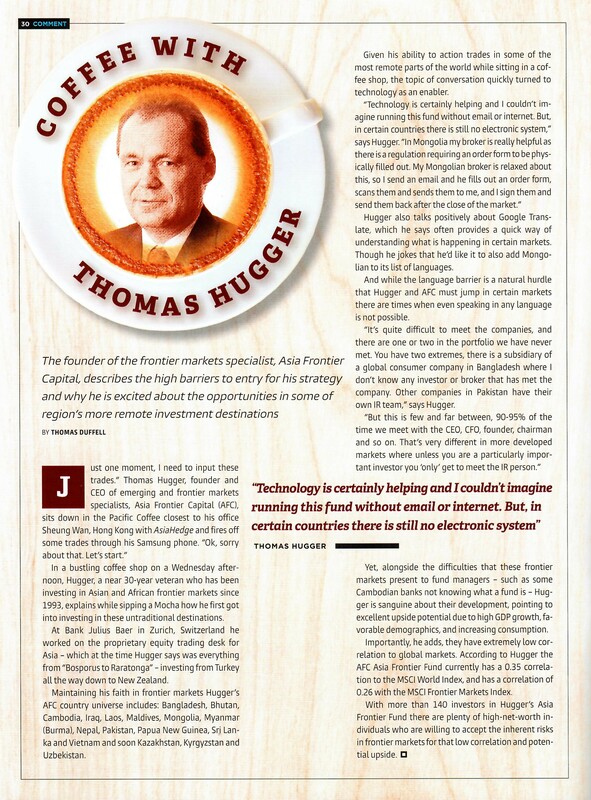 This fund is directed by the founder and CEO of Asia Frontier Capital, Thomas Hugger, who has been investing in frontier markets across Asia and Africa for more than 20 years. The AFC Iraq Fund was launched on the 26th June 2015 and aims to achieve long-term capital appreciation for investors by capturing value and growth potential in the post conflict high-growth & resource rich Iraq market. The fund emphasises long term investment horizon to truly capture the opportunity in Iraq. The fund's investable universe consists of locally listed companies that have their principal business activities in Iraq as well as foreign listed companies that have the majority of the business in Iraq as a whole including the prosperous Kurdish Region of Iraq (KRI). The AFC Iraq Fund offers access to investments in post conflict recovery potential of Iraq, including the KRI, and/or stability in its territory. The AFC Iraq Fund is managed by Asia Frontier Capital (Iraq) Limited, Cayman Islands under the executive leadership team of Thomas Hugger (CEO & Fund Manager) and Ahmed Tabaqchali (CIO) who have more than 47 years of investment experience as well as an extensive background covering global, emerging, frontier and MENA markets. The AFC Uzbekistan Fund was launched on 29th March 2019 and the fund aims to achieve long-term capital appreciation for investors by capturing the value and growth potential in the recently liberalized economy of Uzbekistan. The AFC Vietnam Fund invests exclusively in undervalued listed Vietnamese equities with a focus on small to medium size companies. This market segment offers a unique investment opportunity as the valuation gap between large- and small-cap stocks in Vietnam is significant and offers an attractive investment opportunity. The stock selection process is driven by a fundamental approach, to which the team applies a quantitative overlay in a controlled manner. The core investment process does not target any particular style bias and aims to outperform in most market environments. In conjunction with targeting the maximum upside potential the portfolio has been structured to mitigate corporate government and liquidity risks. The fund invests in a diversified portfolio of 50-80 attractively valued companies to carefully control concentration risk. This approach allows the fund to sell, or buy, positions without having a significant market impact. The fund is managed by Vicente Nguyen, a seasoned investment professional with over 10 years of experience in this field. To subscribe to our monthly newsletter and register as a member on our website please click the 'Subscribe' button below. This information is restricted to qualified investors and Hong Kong professional investors. By registering you are indicating that you are a professional investor and will then be given access to our members area which contains the track record and performance of our funds as well as other information. 02-02-2018 Historic Grievance: A Flawed Narrative for Statehood? * The representative of the AFC Asia Frontier Fund (non-US), AFC Iraq Fund (non-US), AFC Uzbekistan Fund (non-US) and AFC Vietnam Fund in Switzerland is Hugo Fund Services SA, 6 Cours de Rive, 1204 Geneva. NPB Neue Privat Bank AG, Limmatquai 1 /am Bellevue, CH – 8024 Zürich, Switzerland is the Swiss Paying Agent. In Switzerland, shares shall be distributed exclusively to qualified investors. The fund offering documents, articles of association and audited financial statements can be obtained free of charge from the Representative. The place of performance with respect to shares distributed in or from Switzerland is the registered office of the Representative. ** The AFC Asia Frontier Fund is registered for sale to investors in Japan, Switzerland (qualified investors), Hong Kong & UK (professional investors), Singapore (accredited investors) and USA (accredited investors and qualified purchasers). The AFC Vietnam Fund is registered for sale to investors in Japan, Switzerland (qualified investors), Hong Kong & UK (professional investors), and Singapore (accredited investors). The AFC Iraq Fund is registered for sale to investors in Switzerland (qualified investors), Hong Kong & UK (professional investors), Singapore (accredited investors), and USA (accredited investors and qualified purchasers).